Our new redesigned Moto Glide now has a lower edge profile enabling it to be used on even the lowest bikes and can be easily operated by one person. 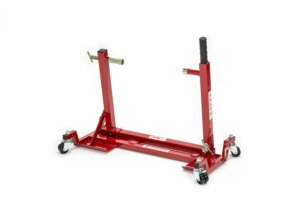 Now with upgraded larger twin castors for ease of movement, combined with a lower price tag means this is a great add-on to any abba Superbike Stand owner. 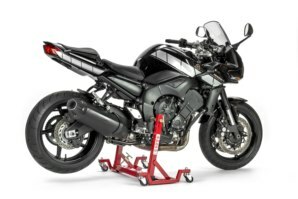 The abba Moto Glide is designed to be used in conjunction with the abba Superbike Stand to make maneuvering your bike around in tight spaces much easier. No more 6 point turns to get the bike out of the garage! 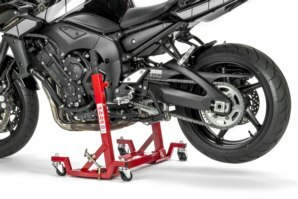 The Moto Glide is a simple to use product and is operated by lifting the Superbike Stand onto the glide base, once in position a simple locking bracket securely connects the Superbike Stand to the Moto Glide for total security. 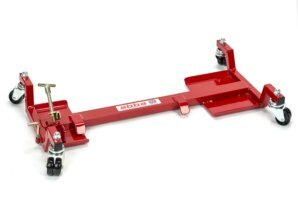 A simple screw down brake enables the operator to keep the Moto Glide safe in one position if required. 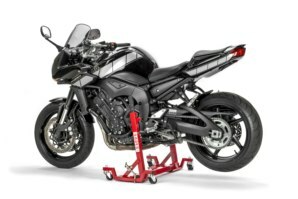 Note: Not compatible with our "special" wide version Superbike Stands used on Triumph: Thunderbird/Adventure/Legend & Tiger. Ducati: Diavel, Multistrada 1100 & Hypermotard. BMW: K1200S/R. 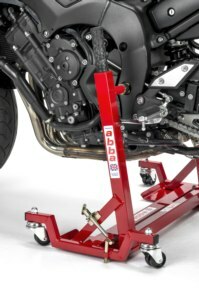 Will fit any abba Superbike Stand new or old. 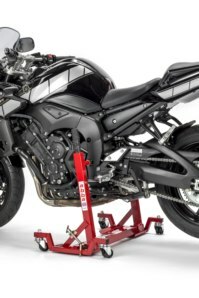 Locking bracket keeps the Superbike Stand securely attached to the Moto Glide. Should have bought the "Moto Glide" years ago to compliment the Superbike stand!! Now I can just glide the bike out from a tight corner and work either side by pushing one way or the other! Very happy, product very well made, with a good finish and genuine "next day delivery" Ordered Thu afternoon arrived Fri morning. 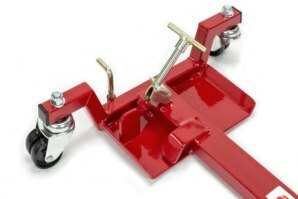 So don't struggle with your pride and joy in and out of tight corners in your garage / workshop just glide. Once again very happy and recommend! 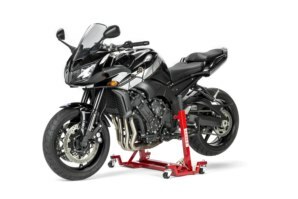 In normal use the front wheel will be touching the ground (as shown in our Video/Pictures) however it is possible to push down on the pillion seat area of the bike to pivot both wheels off the ground and turn the bike around on the spot. 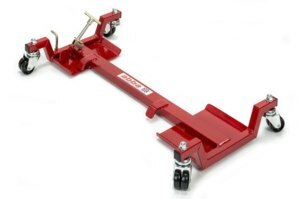 (A small amount of body weight and skill is required to do this) For 360 degree manoeuvrability see our Moto Glide package. Can I use the Moto Glide on my own? Yes. Like any tool a basic level of skill and understanding is required. This product is designed to be operated by a single person with ease. The overall width of the Moto Glide is 80cm. 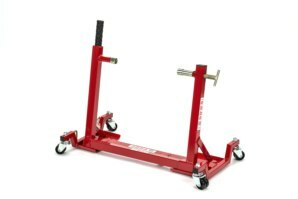 The Moto Glide comes complete with castors and its necessary locking mechanisms. 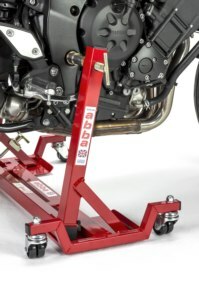 The abba Superbike Stand shown in some pictures is NOT INCLUDED. Got a Question about the abba Moto Glide? If you would like to ask us a question about the abba Moto Glide, simply fill in the form below and we will contact you within two working days. Want to tell a friend about the abba Moto Glide? Alternatively fill in the form below and we will send an email on your behalf to your friend, with a link to this page all about the abba Moto Glide.